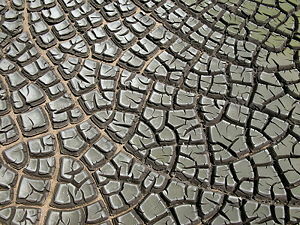 Sludge from a sewage plant has developed cracks as a result of extreme drying (desiccation). Drying is the process of using heat to remove a liquid (such as water) from a material that contains the liquid. The material can be a wet solid or a liquid solution of a solid dissolved in a liquid. The drying process requires a source of heat and a sink that receives the vapor produced. The term drying is also applied to the removal of water vapor from a gas or mixture of gases. In scientific terms, drying is described as a "mass transfer" process. The process that leads to extreme drying is called desiccation. The process of drying can be undertaken by various methods for a variety of applications. Examples range from drying hair after a shower to drying candy at a candy factory to drying semiconductor wafers. Wood drying is an integral part of timber processing, and food drying is often used to preserve food. The process known as freeze drying is used for the dehydration and preservation of pharmaceuticals, vaccines, blood, and some food products. Extensive technical literature is available on the subject of drying. The extraction of liquid from a material can also be undertaken by methods such as centrifugation, decantation, and filtration. These methods, however, do not involve the use of heat and are not considered "drying." The term "dehydration" may mean drying of water-containing products such as foods, but it is also used in other contexts. It is, for instance, applied to water removal by osmotic drive from a salt or sugar solution. In medicine, dehydration refers to a situation in which a person loses water by respiration, sweating, and evaporation, without recovering the "make-up" water required to allow the body to keep functioning normally. In a typical phase diagram, the boundary between gas and liquid runs from the triple point to the critical point. 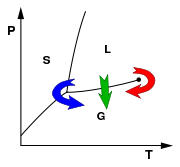 Regular drying is shown by the green arrow; supercritical drying, by the red arrow; and freeze drying, by the blue arrow. Drying can be accomplished by various techniques, some of which are noted below. Heated air drying (convective or direct drying): In this common technique, a heated stream of air (or other gas) heats the material by convection and carries away the vapor as humidity. The higher temperatures speed up diffusion of water inside the solid, so drying is faster. However, the air temperature must be controlled, based on product quality considerations. Air that is too hot can almost completely dehydrate the solid surface, leading to shrinking and closing of internal pores, and crust formation or "case hardening." Natural air drying: In this approach, materials are dried with unheated, forced air, taking advantage of the natural drying potential of air. The process is slow and weather-dependent, so a wise, "fan off, fan on" strategy must be devised. The strategy must take into consideration such factors as air temperature, relative humidity, and moisture content and temperature of the material being dried. Grains are increasingly dried by this technique. The total time (including fan off and on periods) may last from one week to several months. Indirect or contact drying (heating through a hot wall): Indirect drying techniques include drum drying and vacuum drying. In drum drying, a heated surface provides the energy, and aspirators draw vapor out of the chamber that contains the starting material. In vacuum drying, heat is supplied by contact conduction or radiation (or microwaves), and the vapor produced is removed by a vacuum system. Freeze drying, or lyophilization: In this method, the solution is frozen prior to drying and the solvent is then sublimed (that is, converted to the gas phase directly from the solid phase), below the melting point of the solvent. Freeze drying is often carried out under reduced pressure (using a vacuum pump) to allow drying to proceed at a reasonable rate. This process avoids collapse of the solid structure, leading to a low-density, highly porous product that can quickly reabsorb the solvent when needed. This method was first used industrially to produce dehydrated vaccines, and to bring dehydrated blood to assist war casualties. Currently, freeze drying is increasingly used to preserve some foods, such as for backpackers traveling to remote areas. It is regarded as the best method for preserving the quality and biological activity of proteins, vitamins, and other bioactive compounds. Supercritical drying (superheated steam drying): This method involves steam-drying of products containing water. Strange as it may seem, drying is possible using steam because the water in the product is boiled off and combined with the drying medium, increasing its flow. This method is usually employed in a closed circuit and allows a proportion of latent heat to be recovered by recompression, a feature that is not available with conventional air drying, for instance. This approach may have potential for drying foods, if carried out at reduced pressure, to lower the boiling point. Dielectric drying: In this approach, microwaves (radio frequency waves) are absorbed by the material being dried. It is currently the focus of intense research. It may be used to assist with air drying or vacuum drying. Hundreds of millions of metric tons of grains and seeds—including wheat, corn, soybean, rice, barley, oats, sorghum, sunflower seeds, rapeseed/canola—are dried in grain dryers worldwide each year. In the main agricultural countries, drying involves the reduction of moisture from about 17-30 percent (by weight) to values between eight and 15 percent, depending on the grain. The final moisture content for drying must be adequate for storage. The more oil the grain has, the lower its storage moisture content will be (though its initial moisture for drying will also be lower). Cereals are often dried to 14 percent (by weight); soybeans to 12.5 percent; sunflower seeds to eight to nine percent; and peanuts to nine percent. Grain drying is carried out as a prerequisite for safe storage, to inhibit microbial growth. In addition, low storage temperatures are highly recommended to avoid degradative reactions and the growth of insects and mites. A good maximum storage temperature is about 18°C. The largest dryers are normally used "off-farm," in elevators, and are of the continuous type. Mixed-flow dryers are preferred in Europe, and cross-flow dryers in the USA. In Argentina, both types are used. Continuous flow dryers may produce up to 100 metric metric tons of dried grain per hour. The depth of grain the air must traverse in continuous dryers range from some 0.15 m in mixed-flow dryers to some 0.30 m in cross-flow dryers. Batch dryers are mainly used "on-farm," particularly in the USA and Europe. They normally consist of a bin, with heated air flowing horizontally from a narrow cylinder in the center of the bin. Air passes through a path of grain some 0.50 m deep in the radial direction. The usual drying times range from one to four hours, depending on how much water must be removed, the air temperature, and grain depth. In the USA, continuous counterflow dryers may be found on-farm, adapting a bin to slowly drying the grain, and removing the dried product using an auger. Grain drying is an active area of manufacturing and research. It is now possible to "simulate" the performance of a dryer with computer programs based on equations that represent the physics and physical chemistry of drying. The drum dryer technology has kept its position of importance. Today, in foods, potato, banana, and tomato purees are dehydrated to produce flakes. Spray drying is an important technique to produce dried powders. In this method, a pumpable feed is first atomized—that is, converted in a fog of droplets (each about 100 micrometers in diameter). The droplets dry very fast while falling by gravity, accompanied by heated air. The dried particles eventually exit through the bottom of the dryer and are separated from the drying air by a cyclone, or a system based on cyclones, plus bag filters or electrostatic precipitators. Milk powder is possibly the most popular product, and tomato powder is becoming very important. On the other hand, washing powder is an example of the chemical process industry. The production of dehydrated natural flavors and essences is very important and is growing. Another technique is encapsulation, devised to trap a large, volatile molecule (such as the flavor compound) inside a dry particle, the walls of which develop on drying and are permeable to water flux but not to the flux of the larger volatiles. This principle of selective diffusion was first developed by the Dutch researcher Thijssen in Eindhoven, during the 1970s. Spray dryers differ in the type of atomizer, the relative directions of air and product flows, chamber design, type of drying agent (air, nitrogen) in the system characteristics (closed or open circuit), among other features. Equipment can be very large, up to 20 m tall. ↑ Drying Technology, An International Journal Retrieved June 21, 2008. This page was last modified on 9 October 2017, at 21:16.